Here is a photograph of Bill Diddel at age 95 that was given to me by my friend, Dwight Ladd. Bill was still playing golf at this age. He would stripe tee shots down the middle of the fairway, and he could get up and down from just about anywhere. On January 30, 2019, Golf Course Architecture Magazine, an international publication, published an excellent article, penned by Richard Humphreys, on my 27 hole remodel of Old Oakland Golf Club in Indianapolis, Indiana. Click on the link above or the photo below to go to the article. It is a good read and readily captures the essence of this exceptional project. As always, space is limited in publications, so I thought that I would add a few details about the project here. First of all, it has been a pleasure and privilege to work for Steve Sterrett and Old Oakland Golf Club for the past three years. I could not have asked for a better experience, especially working with golf course superintendent, Chase Walden, and his crew. There were many challenges along the way, but Chase always rose to those challenges, exceeded all possible expectations with his expertise, dedication and hard work. Also, it was a pleasure to work with Doc O’Neal of Cohoat and O’Neal Golf Management. Doc’s steady hand and common sense was instrumental in guiding the project’s progress. As mentioned in the article, Old Oakland’s membership has swelled by 100 new members. This is a testament to the success of the project as well as the quality golf course and practice facilities that are presented to the members on a day to day basis. How did you approach the redesign of Old Oakland? 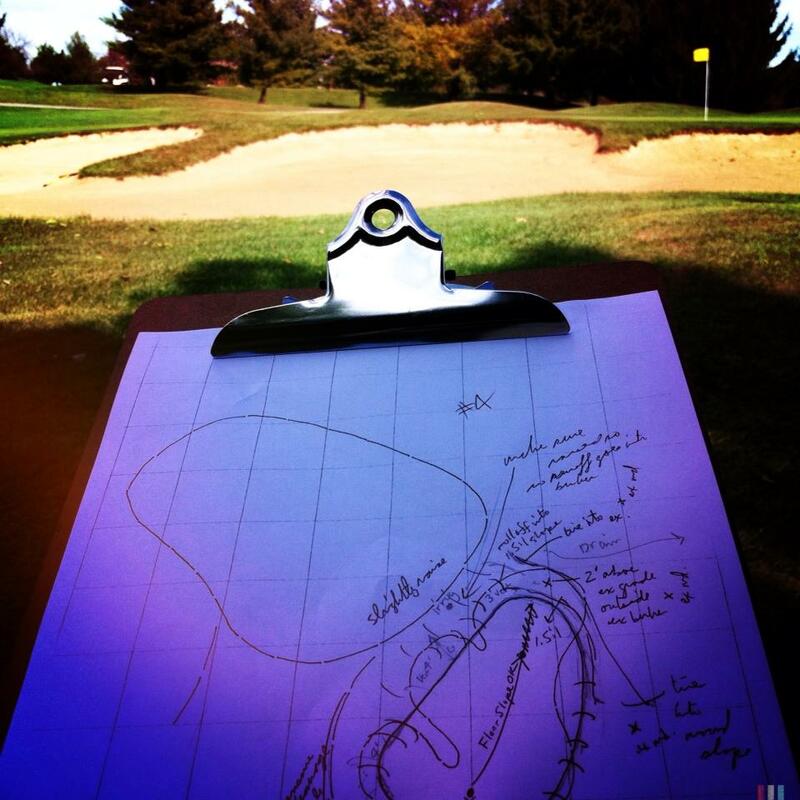 I analysed the routing with respect to the sequence of strategic concepts and penal situations it offers through its topography, natural features, lines of play and golf course elements such as tees, fairways, green complexes, bunkers and mounding. A variety of shot-making requirements into differing circumstances are significant and essential ingredients. This provides a challenging and enjoyable round of golf, day in, day out. In the case of the club’s plan, it was paramount to develop and implement a design that delivers to the golf course definition, strategic options – alternate lines of play for various skill levels – and beauty. All detailed design was performed on site. I spent a significant amount of time on site during construction working hands-on with the shapers, the contractors and the golf course superintendent. Many times, I was on site five or six days a week during each phase of the project. The practice facilities will be among the best, if not the best, in this region of the country. The short game area occupies over three acres and features one practice putting green, two short game practice greens, undulating contours in the fairways and roughs, and two bunkers. We accomplished this part of the project in a very compressed time frame (about three months). Therefore, the drawing/plan for the short game practice area is more rough than I typically produce, but we had to get bids and get to building. I am itching to get out and play all three nines at Old Oakland Golf Club this Spring. I’m also excited to see the opening of, and experience, the new short game practice facility and the other expanded practice facilities. Wow, what an excellent project. I would also like to reiterate, as found in the Golf Course Architecture article, that this project was a total team effort. Thanks to everyone involved in the project, from start to finish – Chase Walden (golf course superintendent) and Crew, Doc O’Neal (general manager), Derek Dirksen (shaper), Ted Blahnik (engineer), Ted Nelson (construction superintendent), Chris Lutzke (construction superintendent and owner), Eric Graudszuz (shaper), Tony Altum (irrigation designer), Adam Garvey (construction manager), Jim Held (irrigation designer), and everyone at Golf Creations, Duininck Golf, Leibold Irrigation, Albanese & Lutzke, Automatic Supply, Commercial Irrigation, and anyone that I forgot! Click on the photos to start a slideshow. On Friday, November 30, 2018, Golf Course Architect, Gary Lee Kern, passed away at the age of 80 in Chesterfield, Missouri. Born on December 27, 1937, Gary grew up in the small town of Kendallville, Indiana. He was the only child of Ralph and Edith Kern. After high school graduation, he went to Texas to attend Texas A&M University for two years, where he began playing golf. Moving back to Indiana, Gary worked in the engineering department of the Indiana Department of Highways for two years. In 1960, Gary became a principal in the civil engineering and land survey firm of Weihe Engineers, Inc. located in Hamilton County, Indiana. In this position, Gary was responsible for land use planning, site design, and engineering drawings for single family subdivisions and multifamily projects. Gary continued to play golf and developed a love of the game which translated to an ongoing informal study of golf course architecture. He read and re-read everything he could get his hands on about golf course architecture, including one of his favorite books, The Links, by Robert Hunter. In 1969, Weihe Engineers, Inc. was commissioned to design Brookshire, a single family community in Carmel, Indiana that included a golf course. Gary suggested to the client that they hire golf course architect, Bill Diddel, to design the golf course. Working together with Bill on the golf course’s design and construction, Gary designed the golf course’s routing and Bill designed the golf course’s features. As they developed a close working relationship throughout the design and construction of Brookshire Golf Club, Bill encouraged Gary to enter the field of the golf course architecture. Bill endorsed Gary to a prospective client as a golf course architect resulting in Gary’s first golf course design commission for Tomahawk Hills Golf Course in Jamestown, Indiana. Gary and Bill continued their relationship throughout the rest of Bill’s life. In 1974, Gary became a full time golf course architect designing and remodeling a long list of golf courses in the Midwest and throughout the country. Gary moved to St. Louis in 1983 and designed many notable golf courses in the area including, Fox Run Golf Club, Lake Forest Country Club, Aberdeen Golf Club and Crown Point Golf Club. His son, Ron came to work with Gary in 1983 and worked with him designing golf courses through 1992. Gary designed golf courses with Hale Irwin for a period of time in the late 1980s and early 1990s, including New England Country Club in Bellingham, Massachusetts. Gary’s golf course design philosophy was to design golf courses that are challenging for good players and enjoyable for all golfers. He was a design “minimalist” using the natural terrain to route the golf course long before that term was ever coined in the golf course design community. Gary leaves a significant legacy of golf courses on which players will continue to enjoy playing the game of golf for generations to come. In retirement, Gary started playing the clarinet again in 2009 and kept busy practicing and playing in two community bands. Gary was an avid St. Louis Cardinals and St. Louis Blues fan and loved attending games and watching games on television. He also loved traveling the world with his long-time friend, Pat Pace. Sadie, Gary and Pat’s dog, held a special place in his heart. A member of Lord of Life Lutheran Church in Chesterfield, Missouri, Gary deeply valued his relationship with the church, the church’s members and the church’s Pastor Below. Bible study was an essential part of Gary’s life. Gary is survived by his long-time friend, Patricia Ann Pace, son Ronald Lee Kern and daughter-in-law, Julie Marie Kern. In lieu of flowers, memorial contributions can be made to the Lord of Life Church, Chesterfield, Missouri and The First Tee of Greater St. Louis. Online listening now available – Click here. Saturday January 13, 2018 morning at 7 am EST my interview about the art of golf course design with Pete Brown was broadcast on WFYI’s promgram, The Art of the Matter. It will be repeated on Thursday January, 18 at 8 p.m. It is a pleasure and a privilege to be a part of this program, which has been an important torch bearer for the Indianapolis Arts scene. While the program hosted by the incomparable Sharon Louise Gamble is being retired by WFYI, great new programming spearheaded by Jill A. Ditmire is on the horizon. I look forward to the new programming and to seeing what is next in store for Sharon. I will post a link to the podcast when it becomes available. Here are two green complexes that I designed and remodeled/restored at Highland Golf and Country Club, the most historic golf course in Indianapolis. The first is the plan view drawing of the 8th that depicts my three dimensional visualization in two dimensions along with a photo of the green complex looking over from the 11th. The second is the 11th. Click on the photos to enlarge. The renovation of the South Course at Old Oakland Golf Club in Indianapolis, Indiana is in full swing. This is phase two of the renovation plan. Phase one was completed last year (2016) when the East Course was renovated. Thanks to Old Oakland Golf Club’s owner Steve Sterrett, the club is on a path to being one of the finest private golf clubs in Indianapolis. His investment into the infrastructure and design of the club’s three nine hole golf courses ensures the long term sustainability and success of Old Oakland Golf Club. It is a pleasure and privilege to work with Old Oakland Golf Club in developing, designing and constructing the improvements to the golf courses. This fall, the South and West Courses are being renovated along with substantial stream improvement projects on 4 golf holes. We have assembled an exceptional team to accomplish the construction. First of all, the golf course superintendent, Chase Walden, is the glue that keeps the project together and makes thing run as smoothly as possible. Along with maintaining 27 holes, he is fantastically busy with the construction project. His staff is incredible, too. They are some of the hardest working golf course maintenance folks in the business. Derek Dirksen is back again to shape all of the features and to assist in finish grading of the stream improvement projects. Derek’s work is absolutely world class and is an important key to the success of the project. Working hand in hand with Derek to shape the golf course’s features is an incredibly rewarding process for me. Duininck Golf is the finish contractor that is installing all bunker elements, including the Better Billy Bunker system in the floors of the bunkers along with finishing and grassing. Ted Nelson is the onsite construction superintendent and Judd Duininck, Ahren Habicht and Paul Deis are assisting throughout the project. Duininck Golf’s skilled work and attention to detail is the best in golf course construction business. Leibold Irrigation is back again to complete the installation of the irrigation system. Their work is incredible and a pleasure to work with. Williams Creek Consulting is designing and constructing the stream improvement projects. Ted Blahnik and company are the best when is comes to environmental and civil engineering. Their work will ensure the sustainability of Old Oakland’s golf holes that play along Indian Creek and its tributaries. Doc O’Neal of Cohoat and O’Neal Management Corp. is the liason between Old Oakland’s membership and all of the activity of the construction project. Cohoat and O’Neal Management Corp. is a fine company that manages many golf course in Indiana and works hard to provide golfers excellent places to test their games. Work is progressing and the weather can not be better. Below are some photographs of the construction up to the last week of September, 2017. I will update the website from time to time with more information. And, there are many photographs and videos that are made and posted daily at this Facebook gallery. This is my dad, Gary, and me. He is one of the great architects of the contemporary era of the greatest game, golf. While his work might not have made the glossy magazines and been a point of contention in irrelevant discussions about top golf course lists in magazines (most likely because he didn’t spend an exorbitant amount of money to construct his golf courses) his beloved designs are consistently enjoyed by golfers of all skills levels. His designs are artistic in a way that utilizes the terrain to define the strategy and beauty of each golf hole. The putting green complexes are the brains behind every design, requiring precision approaches and accurate and confident putting to gain the benefit of a well played golf shot. Yet, the wayward golf shot is not unduly penalized. In other words, his golf courses are fun to play by golfers of all skill levels. And, they are sustainable so they are affordable to play. In all of the financial turmoil of the past decade, none of my dad’s courses have closed because of financial hardship. Instead, they have continued to provide the golfing public, of all means, with wonderful golf courses to test their golfing abilities and enjoy the greatest game. In my mind, this is a lifetime’s legacy that is impressive, is to be commended on the highest level, and is a benefit to all who want to escape day to day drudgery and play the golf, the greatest game, for a lifetime. World class kudos to my dad, Gary, for making life enjoyable for golfers by designing and building some 46 golf courses over the course of his career, as one of the best golf course architects of this era. Saturday, May 8, 2017 saw sunny skies, light winds and warm temperatures for the grand opening of the remodeled East Nine at Old Oakland Golf Club. It was a perfect day. 150 members showed up ready to play their new nine. It is a privilege to work with Old Oakland Golf Club on the design and construction of their 27 hole golf course remodel. This morning I was at Highland Golf and Country Club in Indianapolis for a meeting. A warm front had enveloped the area and the temperature was a balmy 64 degrees Fahrenheit. So, I took a quick walk in the mist and snapped a few quick photos. Even in December Highland’s golf course looks beautiful. It is hibernation, awaiting warm Spring breezes and sunshine. With Chase Walden, Old Oakland Golf Club’s superintendent and Derek Dirksen, golf course shaper, both consummate professionals that excel in their fields. NOBLESVILLE, Ind. — Purgatory Golf Club — named the 2016 “Indiana Golf Course of the Year” by the National Golf Course Owners Association — will unveil an 11-foot tall, signature statue on Monday, Oct. 3, 2016. The bunker project at Pebble Brook is essentially complete. Brad Mays and Phil Ephlin and his crew have worked very hard to bring the bunkers to life. Here are the finished bunkers on golf hole number fifteen green. It is incredibly sad that Eldon Palmer passed away on June 30, 2016. I knew Eldon since I worked at Pebble Brook Golf Club as a very young man. I was there at the golf course when Eldon drove up after closing the deal to purchase the golf course. Eldon’s love of Pebble Brook Golf Club was more than evident as he continued to operate it through many years of difficult times. Today, the golf course is in great hands with John Nichols and Brad Mays at the helm and golfers of all ages and skill levels continue to love the club. My relationship with Pebble Brook is special and has lasted for forty three years, which is hard to imagine. One of the first golf courses that I designed with my father was the North Course in 1986, and it was a pleasure and privilege to re-work the bunkers with Brad Mays just this last year. Here is an old photo of Red and Eldon made around the time that the North Course was under construction. These are two gents that I will always miss. 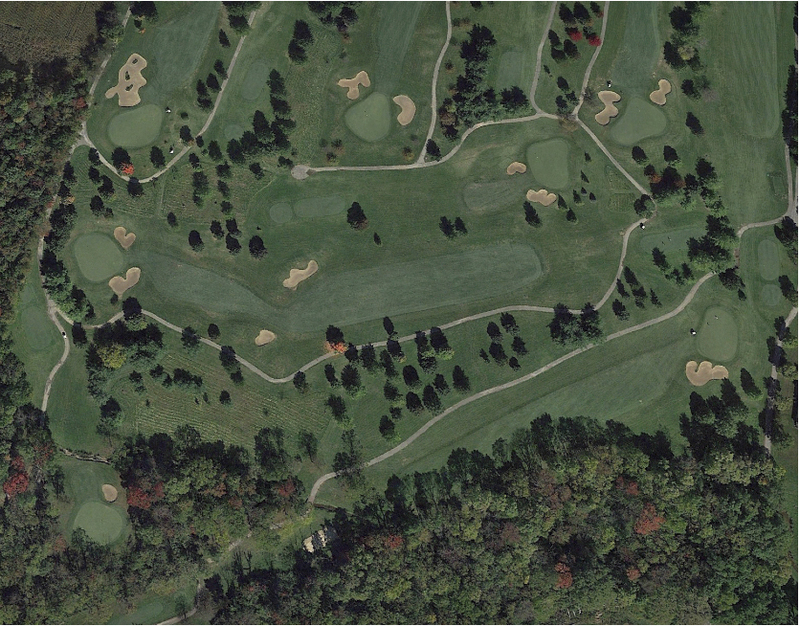 I have been retained to design a three year improvement plan for Old Oakland Golf Club in Indianapolis, Indiana. I look forward to working with Steve Sterrett, the owner, Doc O’Neal, Golf Club Manager and Chase Walden, Golf Course Superintendent. The first project is improving the bunkers on the East Nine. Shaper Derek Dirksen has been contracted to do the reshaping and adding of bunkers and associated golf course features. I have a history with Old Oakland Golf Club as I played in high school state championships in 1975 and 1976 as well as other amateur events. Below is the plan for the seventh green and approach. I will post updates as we progress through the project. Purgatory GC, Noblesville, Ind. A big, brassy 7,700-yard breakout course by young Ron Kern, it’s a daily-fee–and heavily bunkered. All 133 are marvelous splashed-sand stuff, the best since Alister Mackenzie worked his California magic 70 year ago. The bunker remodeling at Pebble Brook’s North Course is progressing. We’ve been blessed with some fine weather in which to work. Shaping is complete, thanks to excellent work by Derek Dirksen, golf course shaper. I thought it would be interesting to take a look at the process for reshaping the left green side bunker on golf hole number 15, so here we go! Here is the existing bunker before remodeling. The North Course’s bunkers originally had grassed faces with rolling capes and bays and the sand was on a slightly concave bottom. Over time, the capes and bays had been edged up to the top of the grade with very steep slopes that then eroded, contaminating the sand causing the bunker to seal up and not drain. The proposed design eliminated the cape and bay design and provides for more simply shaped bunkers with grass faces. During construction when material allowed, some movement was introduced into the bunker design. This is what happened on the green side bunkers here on golf hole number fifteen. In most cases, material barely balanced as we had to generate fill to reconstruct the grassed bunker slopes. Below is a photograph from a 1989 article in the now defunct publication, Golf Course News, that shows three of the original bunkers on golf hole number 8 as constructed in the late 1980s. Note that the writer got my father’s name, Gary (Ken), wrong in the caption, but it was correct in the article! After design work was complete, Pebble Brook’s golf course staff prepared the area for shaping by rototilling and minor excavation. Next, the area was worked into form by the shaper. Derek Dirksen, a very skilled shaper, did all of the shaping for this project. He did an exceptional job within a difficult timeline. In this case, he was actually shaping in a mist and a light sprinkle. Lucky for us, the ground had been very dry, so prepping the area right before he shaped enabled him to complete his work before it became too wet. After working the area to the grades and slopes required, Derek then tracked the work into its final form. Here is a photo of the shaped bunker. Golf course shaper, Derek Dirksen. Next, I painted a line where the sand will go along the edge of the bunker, that sand line was cut and then the bunker was finish graded, drainage was installed and the prepared seedbed was sodded by Pebble Brook’s golf course staff. When the sand is installed, I will update this post to show the finished bunker. The new bunkers meld into their surroundings and existing grade giving them a natural appearance, making the North Course at Pebble Brook feel as if it is more from the golden age of golf course design, rather than a contemporary golf course. Plans are underway to remodel the bunkers on the North Course at Pebble Brook Golf Club, Noblesville, Indiana. My history with Pebble Brook Golf Club goes back to the 1970’s. As a young man, I worked in the pro shop for three summers beginning in 1973, when I was fifteen years old, and my parents had to drive me to work. The first year, the golf professional was Ken Rynerson and the original 18 hole golf course was owned by John Dugan. The next year, Eldon Palmer bought the golf course and hired Red Pitney from Tipton Golf Club as the golf professional. I worked for Red for the next two years. Red was an interesting gentleman – gruff and grumpy as the day is long, yet loyal as could be to his friends and co-workers. He had an interesting history. I remember him telling me about playing with Bobby Locke when Red played the professional golf tour! He showed me how Locke putted with a hooked putter face and a sort of downward stroke that ran into the ground. Those summers were formative for me as I learned about the game of golf as a business and as a player. Over the years, I continued to play at Pebble Brook Golf Club, casually and in events. In 1986, Red contacted my father Gary and I to design a new eighteen hole golf course on property north of the existing eighteen hole golf course. This plan was to use the new north golf course as a venue for outings and as a club type golf course, that was public. Yes, Red was well ahead of the curve with this concept. The golf course was constructed under difficult conditions as a serious drought enveloped the area. And, the golf course was constructed on ground of a somewhat restrictive shape and limited acreage. The golf course we came up with was both fun and challenging, and it is to this day. To combat the narrowness of the playing corridors, a tree planting program was initiated by Eldon’s wife, Elaine. Elaine and I spent many hours locating where to plant specific species of trees, and the plan really paid off. Pebble Brook’s North Course is now a beautiful parkland golf course. Today, the bunkers on the golf course are in need of attention after nearly thirty years of play. They have lost much of their original character of grass faced mounds forming the bunkers. So, we are embarking on a plan to remodel the bunkers to ensure their viability for another thirty years. The new bunkers will be grass faced and feature simple geometric shapes that blend into existing features and the surrounding topography. I look forward to writing about the progress of construction and sharing photographs here on the website. Brad Mays, PGA Professional and Director of Golf will be managing the project. It has come to my attention that the design of Purgatory Golf Club in Noblesville, Indiana is included in the exhibtion, FOREGROUND: THE LANDSCAPE OF GOLF IN AMERICA. The exhibition is at the Center of Land Use Interpretation in Los Angeles. The Los Angeles Times has an extensive review of the exhibition, and names the aerial photograph of Purgatory Golf Club as one of the standouts of the exhibition. Needless to say, I am quite pleased that Purgatory Golf Club is included in the exhibition. With everything else stripped away, except the essence of the golf course as seen from above, it is satisfying to see the artistry of the design and its corresponding landscape recognized as being exceptional. Update: Golf Course Architecture Magazine has published a new article on the Highland Golf and Country Club bunker renovation project. Click here for the article. 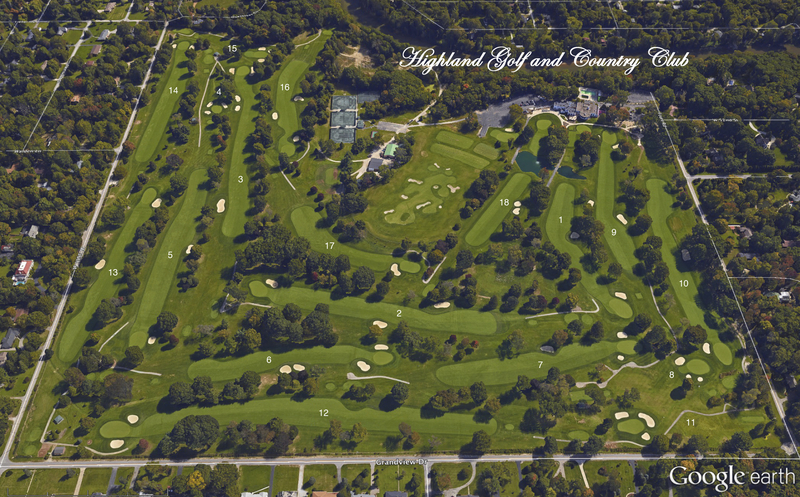 In September of 2008, I completed a Master Plan for Highland Golf and Country Club’s Golf Course. It is a Willie Park Jr. and Bill Diddel design. The Master Plan was essentially a historic restoration and rehabilitation plan. The strategy of the original 1919 design was thoroughly examined and evaluated. The existing putting greens and the slopes of the surfaces in concert with the original bunkering scheme revealed a golf course design by Park and Diddel that was nothing short of exceptional. In late 2013 I designed final construction plans for a bunker remodeling project that was constructed in the Spring of 2014. This is the first of two phases of the bunker project. This phase replaced existing bunkers into proper positions and form. The second phase will add bunkers that were previously removed. A project constructed in the early 1990s removed all traces of the original bunkers and adjusted the strategy of the golf course away from its original design. The club realized that this was a mistake and charged me with reviving the strategy, playability and classic character of the golf course. I designed all of the golf course features in the field. At each location that was to be modified, I visualized what I wanted in three dimensions and then made a drawing with notes to convey the design to the shaper and finish crew, as well as the club’s membership. During construction, I was constantly on site working with the shapers and finish crew to ensure that the features were realized as I intended. The new bunkers are constructed with respect to the character and in the spirit of the original golf course design by Willie Park Jr. and Bill Diddel. The bunkers are formed by mounding that melds into the original construction or the surrounding natural ground. Bill used to say that he wanted his golf features to appear that they were created by the forces of nature, they were not to look artificial, even though they were indeed manufactured by man and machine. The proposed bunkering strategy was adjusted to relate to the contemporary game with respect to the fact that the golf course’s priority usage is member/guest play. The newly constructed bunkers’ appearance are much more of the period of the original construction. They have lower sand lines on more gentle slopes that work into steeper grass faces. The bottoms are gently concave to better facilitate drainage and also to be more attractive and natural looking. The rolling perimeter mounding that forms the bunkers are of variable heights, sizes and slopes. When designing and constructing the new bunkers in putting green complexes, I maintained all existing original contours in the green surrounds. All construction work melded into these existing features such that all new features are in character with the golf course’s original design and construction. The construction project was facilitated by Highland’s Director of Agronomy and Facilities, Ryan Baldwin, CGCS and his A-1 crew. Ryan and his crew helped make the construction project run in a seamless fashion by scheduling, staying on top of material ordering, immediate maintenance after features were constructed and placing sand in the finished bunkers. Sadly, this summer we lost Michael Reynolds to an automobile accident. He is missed greatly. Duininck Golf constructed the bunkers. They did a stellar job in all phases of the project. Judd Duininck and Ahren Habicht were instrumental in implementing and overseeing the progress of construction. Construction Superintendent, Paul Deis, was a pleasure to work with. He ensured that the project was completed in a professional manner. The quality of the construction and finished product is excellent and is the finest that I have seen. Rich Quisberg and Derek Dirksen, shapers of exceptional skill, took the plans and field direction and formed the bunkers as designed, melding them into adjacent features and the existing ground, making them appear as if the bunkers had always been in place. The finish crew provided the “icing on the cake.” They performed incredibly detailed work that resulted in features that drained perfectly and had the character and form that the design required. The Better Billy Bunker system was used for the drainage and floors of the bunkers. This system was perfect for our application and its performance has exceeded expectations. It is a pleasure and a privilege to work with Highland Golf and Country Club to improve and restore their golf course. They are a terrific club to work for. A side note: Highland’s golf course is arguably the most historic in Indianapolis. It hosted the 1926 Western Open that was won by Walter Hagen by nine shots over Harry Cooper and Gene Sarazen. And in 1945, Babe Didrikson won the Women’s Western Open by defeating Dorothy Germain 4 and 2. The day before her win, Didrikson learned of her mother’s sudden death in Los Angeles. A recent photo of the 17th with a lefty hitting his tee shot. The international magazine, Golf Course Architecture, has published an article on Highland Golf and County Club’s recent bunker remodeling project. Penned by Sean Dudley, the article takes a look at the project, my history with Bill Diddel and the exceptional history of the club’s golf course. The article can be accessed at this link. Below is a photograph of the completed 15th green, a par three of 192 yards from the championship tee. More photographs will be forthcoming in the near future.